If you asked me a week before the holiday, "What would you be doing on Christmas?" I would have probably not answered camping. But camping is what I did. And that was thanks to one man, Chris Chen. Chris is a thinker of the unconventional. Besides being the founder of the Sunrise Coffee Club, he has a jonesing for bike camping and tries to do it as much as possible. So the idea of camping on Christmas Eve wasn't such a big deal to him. Or as I soon realized, to me. What obligations did I have for the holiday? I actually had it off from work. I wasn't going out with anyone. My (estranged) family lives on the opposite coast. And I wanted to try out winter camping. Now I realize that winter camping here isn't true winter camping, as there isn't usually snow in the lowlands. But up until now I had never camped later than October (which incidentally happened this year) and earlier than March. I had cabin camped in winter, but that doesn't really count. I'm talking about tent and sleeping bag/mat on cold ground camping. So Tuesday December 24th I took off from work at 3-ish, hopped a MAX light rail train eastbound to Gresham, and started pedalling to Oxbow. At this point dark had descended and traffic was a bit heavy. Not exactly fun. But soon I got passed the suburban crap and into the true rural landscape, my LED headlamp illuminating the unlit road. Some may find this a bit spooky (and the heavy fog didn't help), but there wasn't much traffic out here, and I could "see" it from a ways away due to the headlights. It reminded me of riding on dark rural roads in Connecticut when I was in my early teens: I would watch out for headlights and get off the road when I saw some. The only truly sketchy part was the mile-plus descent into the Sandy River valley. The fog was really bad then, so I only had the yellow dashed line in the middle of the road to guide me down. 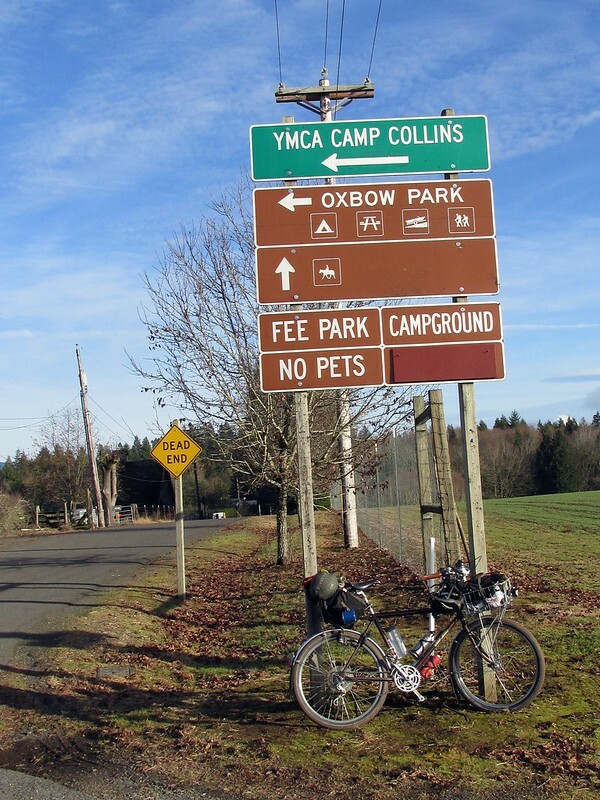 Soon I reached the campsite at Oxbow. Chris and Kelley were already there, and true to their word, had a good fire already going. We hung out, talking until it was time to go to bed. And this would be the test: How would I fare sleeping? The temperature hovered just above freezing overnight. I remember the solo trip I did in March 2010 and being very cold. But I have different equipment now, namely a North Face Cat's Meow bag rated to 20F/-7C. And I had an extra liner, too. And wool thermal layers and thick socks. I decided to forego the liner for now, as the Cat's Meow has been toasty without. And it worked, mostly. There were moments I was on the cold side (esp. in the feet) but no "I'm freezing!" moments, nothing that compelled me to get out the liner. Soon it was morning. The fog had lifted, and we were greeted to a sunny Christmas Day. We hung around camp, making food, talking. Mid-day had come and I had run out of food, so I took off about 1 pm, leaving Chris and Kelley to hang out for a bit more. The climb out of the valley was brutal (10% grade on average) but much better than bombing down it in foggy dark. I rode westward through Gresham to Portland, where I spent the rest of the holiday at Brad and Kim's house. So now I am no longer a winter camping version. Will I try it again soon? I hope. I will admit that camping with people during the long dark winter is a better proposition than doing it solo. There's only so much time I want to spend in a tent by myself.